Manufacturing has a long history in the U.S., as both an economic mainstay and key source of American ingenuity. That will likely continue to be the case, but post recession American manufacturing is otherwise characterized by slow growth and lots of change. So what can we expect from our recovering patient? Like most diagnoses, the future of American manufacturing contains the good, the bad, and the not-too-ugly. Compared to previous years, manufacturing in America has been getting undeniably stronger. According to the American Manufacturing Partnership Steering Committee, manufacturing has added over 700,000 jobs in the last five years, experiencing steady growth after more than a decade of decline. 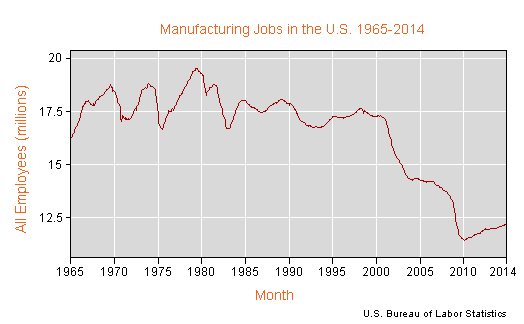 The number of jobs in U.S. manufacturing peaked in 1979 with about 19.7 million jobs. A steady decline throughout the 2000s hit bottom in 2009 when jobs numbered 11.4 million. Positions in manufacturing have been increasing since then, but a tripling in productivity over the last three decades due in part to innovation and automation means that the future workforce will likely be smaller and smarter. In fact, U.S. census data from 2012 shows that manufacturing was a top 3 employer in 25 states. The sector provided jobs to about 11.9 million people with an average income of $53,500. Both these figures are an increase from the year before, when manufacturing employed 11.7 million with average incomes of $52,300. That upward trend continued with over 190,000 jobs added in 2014. A slow shift back to American shores has added to the uptick in U.S. manufacturing jobs. Until recently, overseas production in countries like China offered cheaper options for manufacturers looking to build factories. However, the rise of China’s economy has seen an increase in wages for Chinese workers. Now, companies like Beijing-based Lenovo, who recently opened a manufacturing line in Whitsett, N.C., are finding it more cost effective to manufacture inside the U.S. The resurgence of U.S. manufacturing has been slow. There are currently about 12 million Americans working in manufacturing, but it will probably be a long time before the sector sees the number of factory jobs return to the levels of the 1990s, when there were more than 17 million factory positions. Manufacturers are also seeing, and coming to expect, higher output from fewer workers thanks to technological improvements. This means that industry leaders may not necessarily require all the employees they would have hired 25 years ago. In fact, higher per-worker output within the U.S. is part of what’s driving foreign manufacturers to consider opening factories on American soil. U.S. manufacturers now produce three and a half times more output per worker hour than they did in 1979 when manufacturing peaked at 19.7 million jobs. This increase in productivity is great for the economy but it limits the availability of jobs. This is because many gains in productivity come from sending low-value jobs overseas and replacing workers with machines. Changes in manufacturing technology are also changing what manufacturing jobs mean. That is, as new manufacturing methods like 3D printing become more common, the jobs the industry creates may not be the jobs that potential employees are prepared to fill. American manufacturing may not be in the position to drastically expand job openings, but moving their facilities back to the U.S. is still a very good thing. It’s also very plausible. According to the Boston Consulting Group the U.S. could have lower manufacturing costs than Japan or Europe this year, which would drastically improve the likelihood of large-scale manufacturing movement to the U.S.
Also, although the recent upswing in manufacturing has been small compared to decades past, any improvement is still good for the economy and provides jobs. Those jobs may not be the same as they were in the 1980s, but it’s important to remember that the impact of technological change on work and wages has been generally positive. Of course, smarter machines require smarter workers, so education is key. 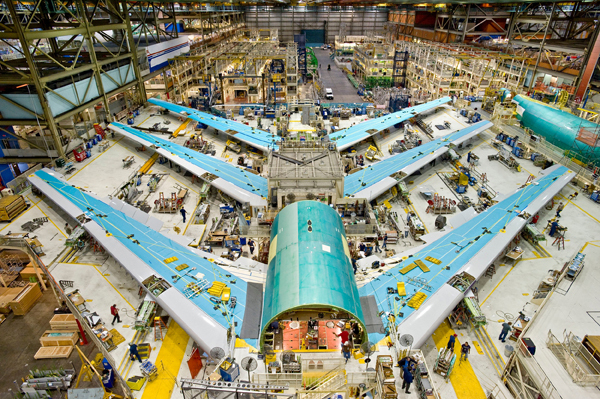 Boeing 747-8 assembly line. U.S. manufacturers are investing in advanced equipment, automation, and robotics in order to drive down the cost of production and compete in the global economy. Manufacturing operations using highly sophisticated new tools and new materials require highly trained workers capable of learning new skills. It’s difficult to predict the long-term future of manufacturing in the United States, but a few things are clear. The first is that manufacturing remains a mainstay of the U.S. economy. It accounts for 12 percent of GDP and continues to grow. The second is that the sector continues to become more technologically sophisticated in its efforts to increase productivity and remain competitive in the global market. That means that in the future, the pool of workers will likely be smaller, smarter and more adaptable. Please visit American Welding Online, where you’ll find online courses, lectures, a link to our YouTube channel, and other digital tools to help you improve your welding career. And as always, we invite you to express your thoughts about the state of manufacturing in America in our comments section. I love welding and all that has to do with manufacturing. Lean manufacturing is my hobby welding pipe vessels and structural have been in the industry 28 years and have never seen such hard times in casper Wyoming had to take a 30 dollar an hour pay cut just to support my family in these hard times wish there was better work in a different state that my family could live life again. It is a humbling experience for sure. Hard times for a family is not funny. Lifelong learning is the only way to have the resiliency needed for a constantly changing world. I have been working for the last 10 years building vessels under AMSE code and have wanted to become a certified welding inspector. I would like to be an outside inspector, checking hold points among other things for customers. Can anyone tell me which code I should take an exam under. D1.1 api1104 etc. I’ve heard various ways to get certified for this type of job. Any help is appreciated. I am curious..Is there a separate test for ASME CWI? If so, how is it interchangeable with AWS CWI credentials? Unfortunately… Welding is an underappreciated skill nowadays. Either your road dogging it, making decent money, or your pounding it out at a factory making scratch, but you get to go home at night. Those are your choices as a welder here in the USA. Please advise if this is a norm, or what your opinion will be on this type of thing.? Great article and I loved reading all of the comments… it was interesting. I also didn’t know manufacturing was a top 3 employer in 25 states in 2012. I wonder what the number is now in 2016…. Anyways great post, keep up the good work!